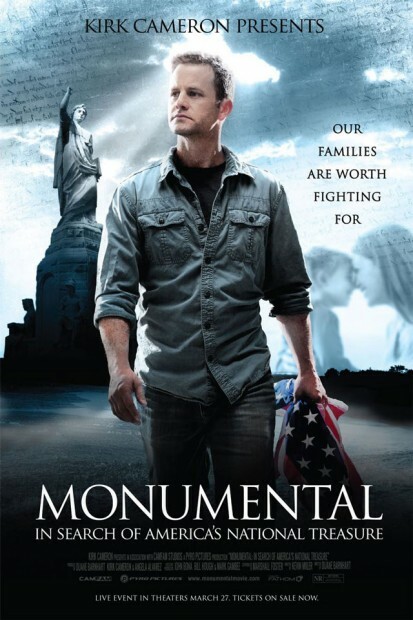 Monumental is a 90 minute factual movie about America’s beginnings. In an intense search to find out answers concerning the formation of this county, Kirk Cameron travels to England to begin his quest;and ends it in America. In order to do that, he interviews a few scholars, professors, and key individuals who possess the critical knowledge that will unlock the doors for Kirk Cameron to walk through. Cameron takes this journey because he is immensely interested in the formula that once established this nation to be a beacon of light. He starts this search to find that formula because he believes that his family’s future is worth fighting for. Although he believes God is sovereign, he does not believe it is right to just sit idly and be passive, while evil is penetrating its darkness upon this nation. He believes this search will be beneficial and critical to the future of his kids and others, because it is important to know and learn how to apply the foundations that were implemented in this country’s past to today. In this movie, he covers many critical components concerning the formation of this country. 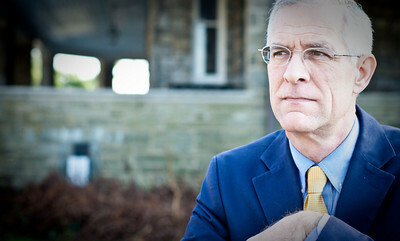 What I appreciated the most was his attempt to connect the dots, where many in the public school system, have failed to do so because of their liberal agenda. I won’t cover every detail because you will have to watch the movie. Some of the critical components started with his journey to Bathford, England to meet a local historian and pilgrim expert named Sue Allan. Expecting to get a lesson on the Pilgrims or also referred to as the English Separatists, Kirk gets introduced first to the Puritans. To understand the English Separatists, one must first understand the Puritans. They were the vital component that started the seed to America’s formation. What Cameron learned from the interview blew his mind and changed him greatly. But the journey only started from that initial interview. I would recommend this movie. It will walk you thorough the keys and components to this country’s development. And it will reignite your passion to appreciate the power of God’s Word for a nation. a. This covenant is God’s covenant to David and David’s descendants. III. Is the Davidic Covenant forever? a. Matthew 1:1- “Son of David” mentioned before “Son of Abraham”! b. Matthew 2:2- Jesus is the King of the Jews! The book will be shipped out October 1st, but you can already order it! To order the book, click HERE. This is a book on whether women can preach and specifically preach in the open air scene. As the author points out, sometimes among some who are theologically conservative, the line is blurred concerning whether women can engage in open air preaching while theologically they won’t allow women to preach at church or be a pastor, etc. This book is calling Complementarians to be consistent. The author, Tony Miano, approaches this topic with great humility and confesses that he use to be among the camp that thought it was appropriate for women to engage in open air evangelism. An open air preacher who has worked with Ray Comfort’s ministry, Tony does not engage in personal attacks of those who disagree but engages the issue with Christian conviction, gentleness and a winsome manner: I was touch to read his apology for misleading people in the past with his former position. I appreciated Miano’s call for the readers not to read with an open mind, but an open Bible; in other words, to be Bereans. The book is divided into two parts, with the first being the presentation of his case for why women should not be engaged in open air preaching. Chapter one takes us back to Adam and Eve with God’s creation and His intended roles for man and woman. He argues that gender roles were existent before the Fall. Chapter five is the meat of the book where Miano does word studies on the Greek word for preaching, woman, etc. Miano also analyzes the counter-arguments. Miano makes it clear that he’s not against women evangelizing and it was helpful that he delineated what women can do for evangelism in chapter eight He also has a moving story of what a man cannot do in evangelism that a woman can (you will have to read it yourself). Part two features various interviews of pastors and preachers on their view of women and whether they can preach. While I don’t want to take away from the main focus of the book, I also wanted to note other things I like about Miano’s work apart from the women preaching issue: I appreciated how the preface was evangelistic which reveal how Tony Miano is a true evangelist, since you can never know if a nonbeliever is reading this book. Miano has a very nuance definition of evangelism as well. As a former Marine radio operator, I also appreciated his analogy of the prayer warrior’s role in evangelism: “The praying saint is the radio operator of a platoon pinned down by enemy fire, calling in air strikes to protect and maybe even save his comrades in arms.” One gets to see what makes Tony tick: He desires to be biblical and raises the par of open air preaching above the stereotype that sadly can be far too typical: He stresses the importance of local church and the par for open air preachers to be raised! This will be the topic for his next book, “Should He preach?” Seeing how helpful this book is, I am already anticipating the next one. NOTE: This book is provided to me free by Tony Miano without any obligation for a positive review. All opinions offered above are mine unless otherwise stated or implied. This blog started seven years and three days ago. I signed up exactly three years ago yesterday (Sept 25th). We were three Reformed Evangelicals men who were at that time serving in the military or were veterans and happen to like theology, the Bible, apologetics, Presuppositionalism, philosophy, politics, hermeneutics and books (lots of it! ): in a word, we love God, Jesus and the Christian worldview. There were some changes along the way but I think we stay true to our purpose of blogging and providing Christian resources online. And how appropriate it was that yesterday we hit a milestone. 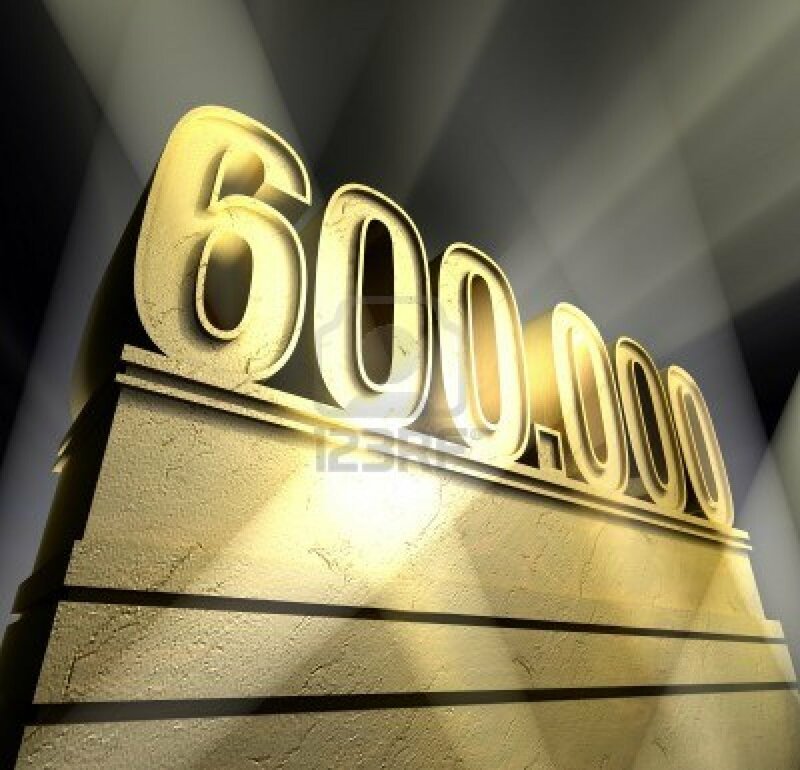 Yesterday at 9:30 PM Eastern Standard Time, we had our 600,000th hit on our blog. Thanks to all of you who have visited and shared our posts to others! I wish more commentaries of the Bible were like this one: plenty of exegetical insights into the Hebrew texts with vast lexical notes and some grammatical and syntactical observations. I appreciated how the author’s insightful is useful for those studying the Hebrew text for expository preaching while at the same time it’s not so technical that it cease being beneficial for a knowledgeable lay reader. 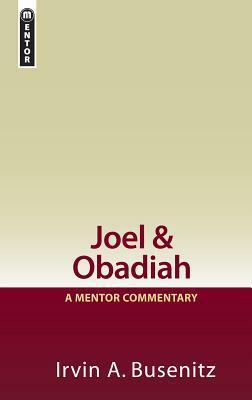 The bulk of the commentary is on the book of Joel rather than Obadiah. I appreciated the introductory materials on Joel here, especially since there’s so much scholarly debate about the book and how Joel has so little internal evidence in regards to authorship, dates, etc. Dr. Busenitz does a good job in the commentary of surveying different positions concerning introductory and background matter, and offer reasons for the conclusions he lands on (rare in commentaries these days). There’s been many occasion as I read the text from Joel I was wondering what was going on, and Busenitz’s commentary has been helpful. I definitely recommend this whether you need a commentary to read along with your devotional or if you need a commentary that touches on the Hebrew text for your exposition. 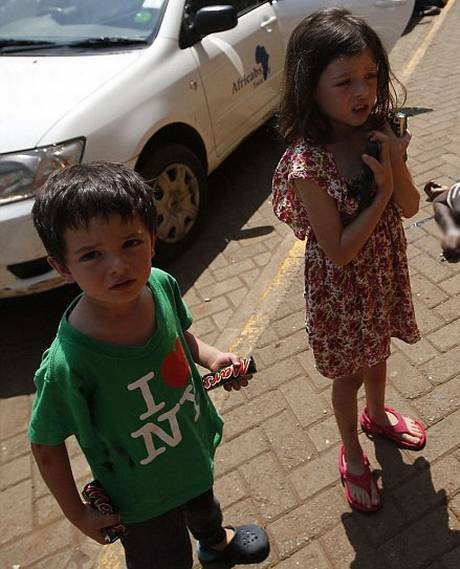 A four-year-old British boy survived the Kenya shopping mall attack after telling an armed jihadist ‘you’re a bad man’, according to the boy’s uncle who has given an interview to a UK newspaper. After apparently seeing his mother shot in the thigh, young Elliott Prior is said to have confronted the gunman shouting “you’re a bad man, let us leave”. Incredibly the gunman in understood to have took pity on Elliott and his six-year-old sister Amelie, giving the pair a Mars bar each and allowing them and their mother to leave the chaotic shopping mall in the middle of the terror attack. Elliott’s 35-year-old mother Amber was reportedly able to grab two more children – including a wounded 12-year-old boy whose mother had been murdered – before exiting the shopping mall and taking the children them to safety. If all this is true, in light of the news that women and children has been killed by these terrorists, it’s amazing this young boy and his family was spared. 1.) Here we see that a four year old knows what’s right and wrong and has a better moral compass than the terrorists. 2.) I think most people who read this would agree that moral relativism goes out the window when we are challenged with moral evil in the real world. I don’t see any news story that condemns the boy with “Who are you to Judge?” The boy is right on! 3.) This little boy has moral courage! Likewise, we need to have moral courage like this little boy to confront what is evil. It does take courage to call out the wicked. 4.) This story confirms what the Bible teaches about the conscience: The terrorist even begged ““please forgive me.” It’s hard to suppress the conscience 100%, 100% of the time. 5.) The power of the “law” (moral law) is amazing: While it does not always lead people to Christ, it does have it’s effect at times of restraining evil some of the time when the conscience is invoked.